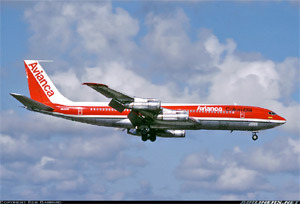 Avianca Airlines Flight 052, a Boeing 707-321B, was a scheduled international flight from Bogota, Colombia, to John F. Kennedy (JFK) International Airport, New York. Poor weather conditions in the Northeast of the US led to the flight being put into holding three times for a total of 1 hour and 17 minutes. During the third hold period the flight crew reported that the airplane could not hold longer than 5 minutes, as it was running out of fuel, and that it could not reach its alternate airport, Boston-Logan International. Subsequently, the flightcrew executed a missed approach to JFK. While trying to return to the airport, the airplane had a loss of power to all four engines and crashed in a wooded residential area in Cove Neck, Long Island, New York. approximately 16 miles from the airport. The crash was determined to be the result of fuel exhaustion brought about by poor flight crew planning and communication both with air traffic control, and among the flight crew. There were 158 passengers and crew on board. 65 of the 149 passengers, and 8 of the 9 crew were killed.